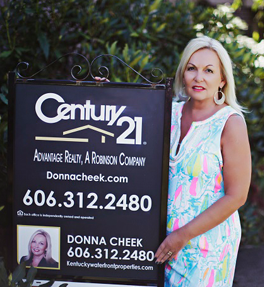 Donna Cheek is an Extreme Marketing Specialist. Marketing on many website besides the local Mls. Lexington Bluegrass Association of Realtors (LBAR). Including Top Exposure Sites like Century21.com, the National Association of Realtors Website Realtor.com and Top rated Zillow.com and Trulia.com. This website DonnaCheek.com was designed with a wealth of information all at your fingertips. Donna also owns her own lake front website KentuckyWaterfrontProperties.com. Making sure your property gets proper exposure across the Entire Nation on these top National sites. Donna does custom tours of her properties which feeds to about a dozen additional websites.